Bus-only lane on Georgia Avenue by Matt’ Johnson licensed under Creative Commons. Your bus ride in DC may get quicker this summer, thanks to a proposed downtown bus lane pilot. Buses on H and I Streets past the White House will get dedicated bus lanes during rush hours from early June to late September. 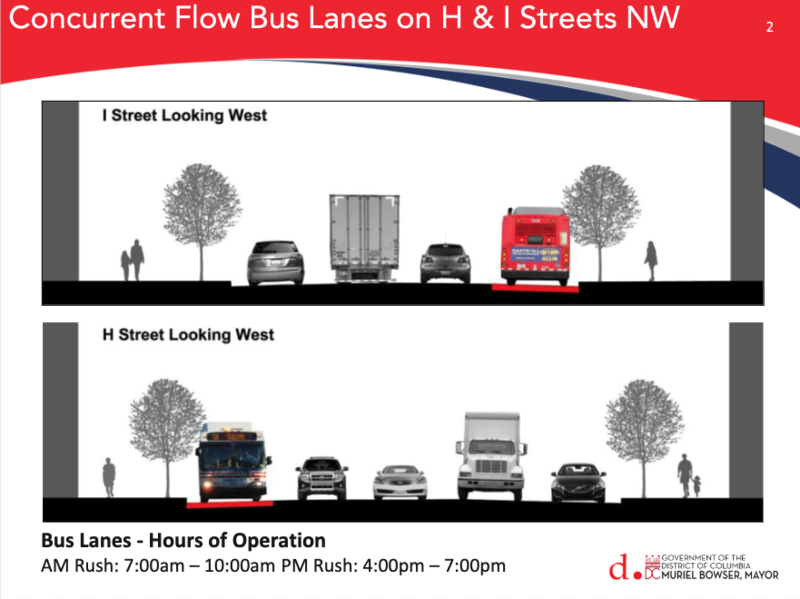 Between the hours of 7 and 10 in the morning, and 4 and 7 in the evening on weekdays, the District Department of Transportation (DDOT) plans to use the right curb lanes of H and I Streets NW as bus lanes. The lanes will run on H from Pennsylvania Avenue to 14th Street, and on I from 13th to Pennsylvania. 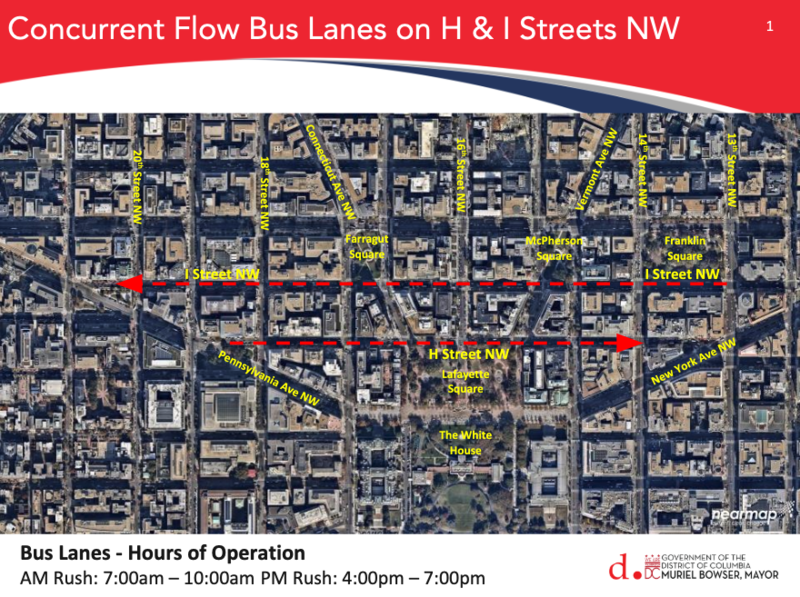 Pilot bus lane routes on H & I Streets NW by DDOT. Parking probably won’t be directly affected because it's restricted during rush hour on both streets anyway. And it’s not only buses that can use the lanes: right turning vehicles, bicycles, charter buses, school buses, and marked taxis will all be able to use them. The lanes won’t have any physical barrier separating them from the rest of the road, but will be painted with a red cross-hatched pattern. Diagram of what the lanes will look like by DDOT. Anyone who’s ridden a bus down H or I Streets downtown knows how slowly buses can travel on those routes, especially during peak hours. Data from 2012 (possibly due for an update) suggests buses along these corridors can move as slowly as an eye-watering 3.6 miles per hour. With up to 70 buses per hour in the peak, that’s a lot of people suffering awfully slow journeys. Metro will be closing part of the Blue and Yellow lines over the summer, which will put even more people on the bus along those routes. In the same 2012 study, DDOT estimated that the affected bus routes are used by up to a fifth of overall Metrobus riders in DC. The agency plans to evaluate the pilot on an ongoing basis and will look at how the lanes impact the safety of different modes of travel, bus speeds and their reliability, and how the lanes affect other forms of traffic. There’s long been interest in using dedicated lanes to improve bus service along this highly-used corridor. In 2014, DDOT pulled out of a planned study of a proposed contraflow bus lane on H Street NW, which would have addressed some of the same issues, for ambiguous reasons. This isn’t DDOT’s first rodeo with pop-up bus lanes. Last summer, it installed a temporary bus lane on Rhode Island Avenue NE to help with journeys impacted by the Red Line being partly closed. However, some people were frustrated that those dedicated bus lanes weren't enforced, which made them less useful. Unlike the Rhode Island Avenue lanes, this lane will have cross-hatched red paint to make it clearer to drivers that there are different rules for use of these lanes. At community meetings, DDOT transportation planner Megan Kanagy said that there wouldn’t be a more substantial bump or barrier since this is a pilot, though this could be something to consider later. DDOT is, however, working closely with the Metropolitan Police Department and the Department of Public Works (DPW) to actively enforce the lane’s rules. Enforcement may be the make-or-break issue for whether the H & I bus lanes work. Allowing part-time parking means that drivers may not move their cars during peak hours when the lanes will be in operation. To make the message clear, DPW and DDOT need to be ready to get errant parked cars towed the moment the lanes are launched. The planned cross-hatched paint needs to be extremely visible to catch the attention of drivers who aren’t familiar with the pilot. Finally, since right turns are still permitted in the bus lanes, drivers might be tempted to enter them earlier than they need to in order to make their turns. If this pilot’s going to be more successful than the disappointing Rhode Island bus lane, DDOT needs to have solid, immediate, and effective plans to deal with these foreseeable issues. And, hey, why not everywhere? Bus lanes are also (gradually) appearing in the District on a more permanent basis. DDOT is currently working on implementing a bus lane on 14th St in Columbia Heights and on 16th St NW as well. Bus services can be a great way of getting lots of people where they need to go. They’re better for the environment than individual cars, they promote transit equity because their stops can get closer to residences and other places than Metro stations, and depending on their design, they can be more accessible to people with mobility challenges. Getting more people out of cars and into buses could also pay dividends for the mayor’s Vision Zero push, which includes a critical approach to how our road space is allocated. Bus use consolidates the number of vehicles on the road, and makes it so that a higher proportion of drivers on the road are professionally trained. There are other ways to make buses more efficient. In addition to dedicated bus lanes, buses could have all-door boarding, payment could be done prior to boarding or be made cashless, and stops could be spaced more evenly. But each of these approaches comes with costs. There are equity and accessibility implications to consider—some riders don’t have access to card-based payment, and some people with mobility challenges aren't able to travel an extra block or two to get to the bus stop. DDOT staff have been taking their show on the road for the last few weeks, presenting plans for the temporary bus lanes to the Advisory Neighborhood Commissions in areas that are affected. Local businesses and other civic groups will also be part of the engagement process. Creative approaches to improving transportation for the public will often come with a cost, whether that’s less parking or slower traffic for private cars. We have to be willing to experiment to ensure that the way we divide up the roads—an important public asset—reflects our values, whether that’s safety, equity, doing less damage to the environment, or other issues. We’ll be following the launch, use and enforcement of the H & I Streets NW pilot bus lanes. Sign up here to get updates as they happen!